Martin H. Simon/Getty ImagesBroadcom CEO Hock Tan spoke at the White House Thursday alongside President Donald Trump. Chipmaker Broadcom is reportedly exploring a deal to acquire rival Qualcomm, which is valued at more than $US80 billion. 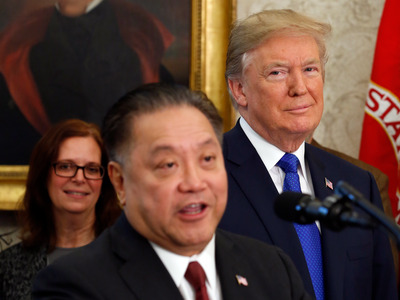 Broadcom CEO Hock Tan joined President Donald Trump in the White House Thursday to help unveil the White House tax plan and announce the company’s relocation to the US. The potential merger features the fourth- and sixth-largest chip makers in the world, and would likely come under antitrust scrutiny from the US Department of Justice. Semiconductor giant Broadcom is reportedly exploring a deal to acquire rival Qualcomm, with news of the potential tie-up coming a day after its top executive made a high-profile visit to the White House to support President Donald Trump’s tax plan and announce its relocation to the US. Bloomberg reports that Broadcom, which generates $US13.3 billion in revenue and has a market capitalisation of $US109 billion, is pursuing an acquisition of San Diego-based Qualcom, which generates revenue of $US22.3 billion and has a market capitalisation of $US87 billion. The potential marriage of industry rivals — the fourth- and sixth-largest chip makers in the world by market value — would almost certainly come under antitrust scrutiny from the US Department of Justice, which just this week made overtures to block AT&T’s $US85 billion bid for Time Warner. Broadcom CEO Hock Tan joined Trump in the White House Thursday to announce his company would relocate its headquarters from Singapore to San Jose, California, lauding the White House’s tax plan and efforts to make the US more business friendly. “Thanks to you, Mr. President, business conditions have steadily improved. The proposed tax reform package will level the global playing field and allow us to compete effectively in worldwide markets,” Tan said during his address. Broadcom’s relocation to the US could help Broadcom circumvent scrutiny on one deal already in the works. The company has been trying to complete a $US5.5 billion acquisition of technology firm Brocade Communications Systems since last year, but the deal has been hung up awaiting approval by the Committee on Foreign Investment (CFIUS) in the United State — a government committee that vets foreign investments in US-based companies. The two firms had initially set a November 1 first deadline to complete the deal, but last month they pushed the deadline back. Since Broadcom will be a US-based firm itself, it will no longer need approval from CFIUS. But a deal for Qualcomm would dwarf that transaction, and would presumably earn a close look by regulators since it involves two of the largest chip-makers in the world.